On Sunday 31 January 1971 a capacity audience filled London's Royal Albert Hall for one of a series of special concerts to mark the centenary of this world-famous venue. 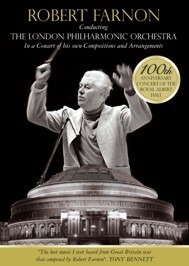 This DVD features the London Philharmonic Orchestra performing compositions and arrangements by Robert Farnon with the maestro conducting, and after thirty-six years it is wonderful to see Farnon again in full command of the forces of one of Britain's great symphony orchestras. During his long career he conducted all of the four major symphony orchestras of the capital. By the time that this concert was staged Farnon had been in demand in concert halls throughout Europe and America, where he appeared at Carnegie Hall. He had made highly praised recordings with Frank Sinatra, Sarah Vaughan, Joe Williams, Lena Horne, Eileen Farrell, Vera Lynn, Sheila Southern and Tony Bennett, and with Tony Bennett it was only natural that they should be paired for this very prestigious event celebrating the 100th Anniversary of the Royal Albert Hall. Robert Farnon was widely regarded as the world's greatest composer of Light Orchestral music during the second half of the twentieth century. He was also revered as an arranger of superb quality, having influenced most of the top writers on both sides of the Atlantic during the second half of the 20th century. A great lover of jazz, some of his closest friends were Dizzy Gillespie, Oscar Peterson, Sir George Shearing, George Benson and J.J. Johnson.